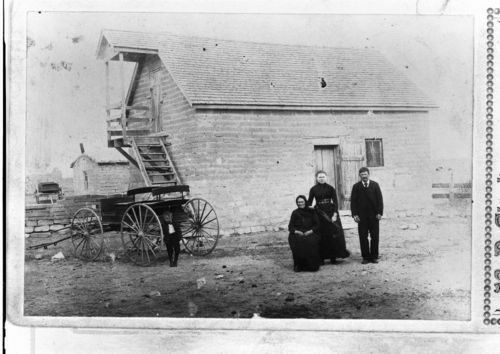 This black and white photograph shows a view of Henry Werth's farm in Schoenchen, Kansas. Standing before the structure are members of the Werth family dressed in their traditional Volga German clothing of dark and simple dresses and suits. Identified from left to right: John A. Werth, Mrs. Karl Werth, Rosa Werth, and Henry Werth.